This sounded delicious and fun. So I tried it. But I only had frozen banana slices left. 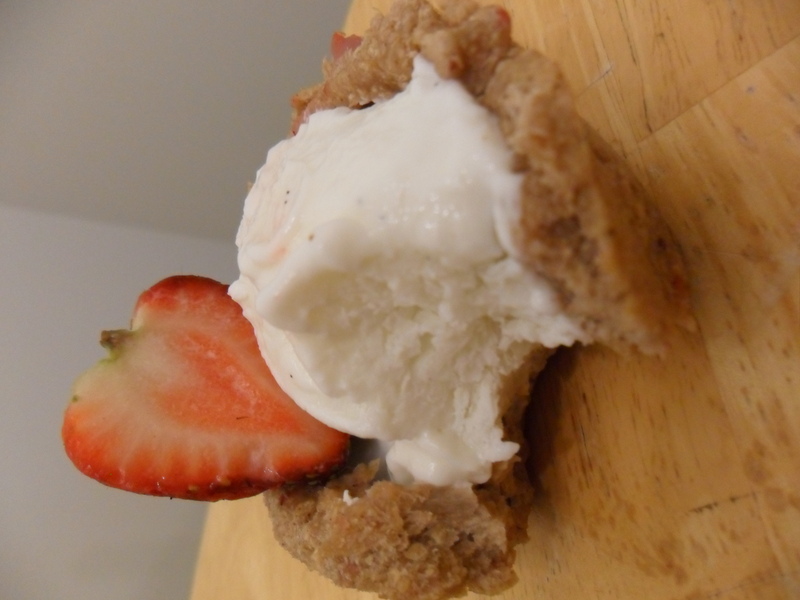 So I made this recipe a little more “a la mode.” No, there’s no ice cream. I’ll explain. 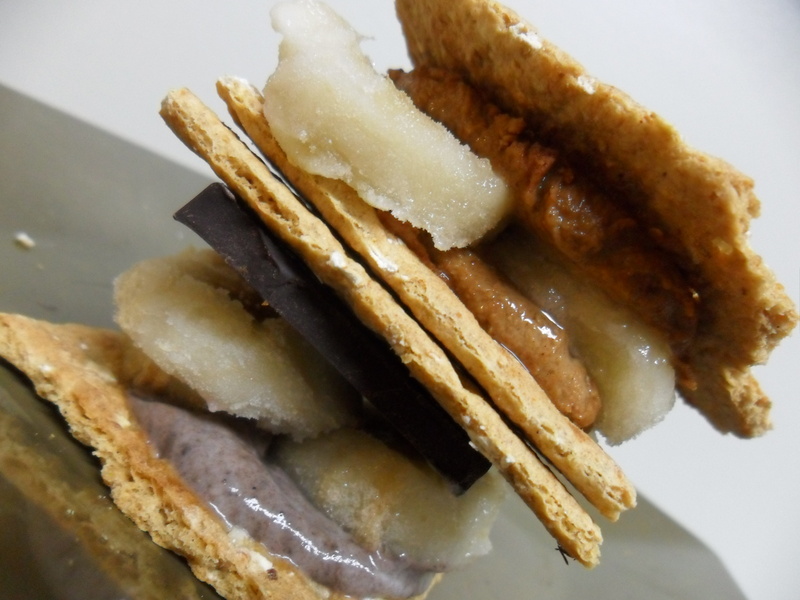 You’ve probably seen or read my postings on the deliciousness of frozen banana ice cream. 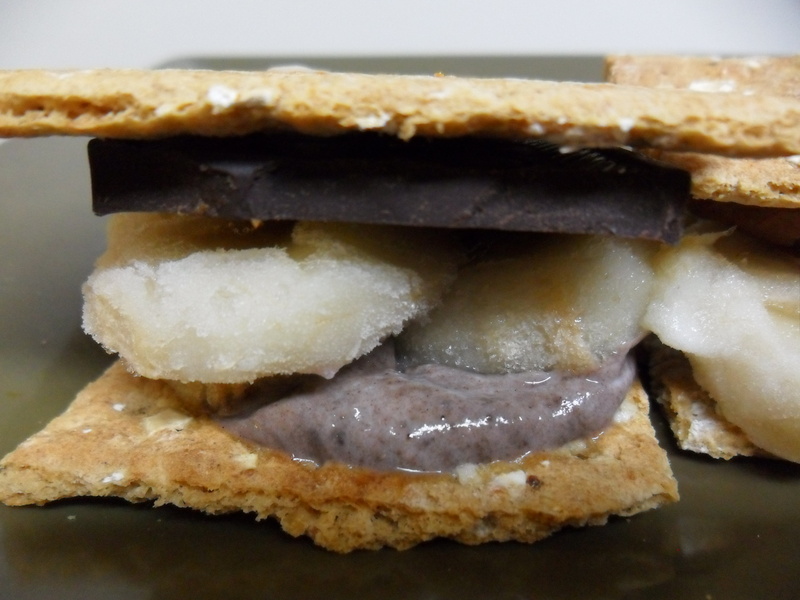 By freezing bananas in little slices, you get the consistency of ice cream and all the sweetness with out undesirable sugar additives. So then I decided I wanted my peanut butter chilled, too. And then I thought it would be tasty to do a layer of chocolate fro-yo (simply mix 1/2 t cocoa powder with a pinch of stevia and vanilla to 1 T or more plain organic yogurt). And then I added a little dark chocolate. 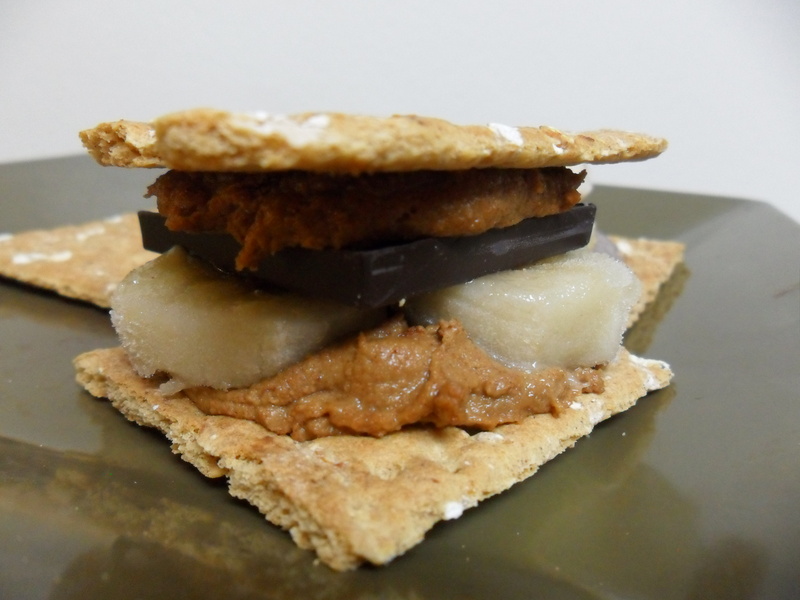 And if you’re worried about finding a healthy alternative to graham crackers, consider making your own with this recipe or buying my health market favorite, Back to Nature Grahams. This is more of a great idea (or two) than it is a new recipe. In a cake cup, you add in something you love. For me, it was my healthified fro-yo fix, which you can make simply by taking your favorite yogurt and freezing it for about an hour. Garnish with some sweet fresh berries and voila! A dessert that does a body good. To make, simply follow any one of my single-serving cupcake recipes. 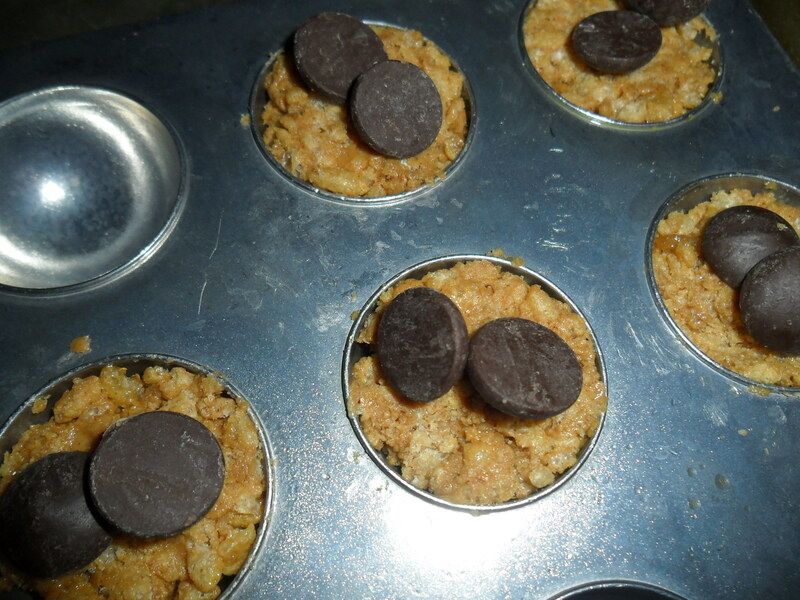 But instead of filling the muffin tin slot as you normally would, gently press the dough up the sides of the slot. Bake for about 5-6 minutes (less time is needed because the dough is spread more thinly). Let cool and add in your favorite filling. 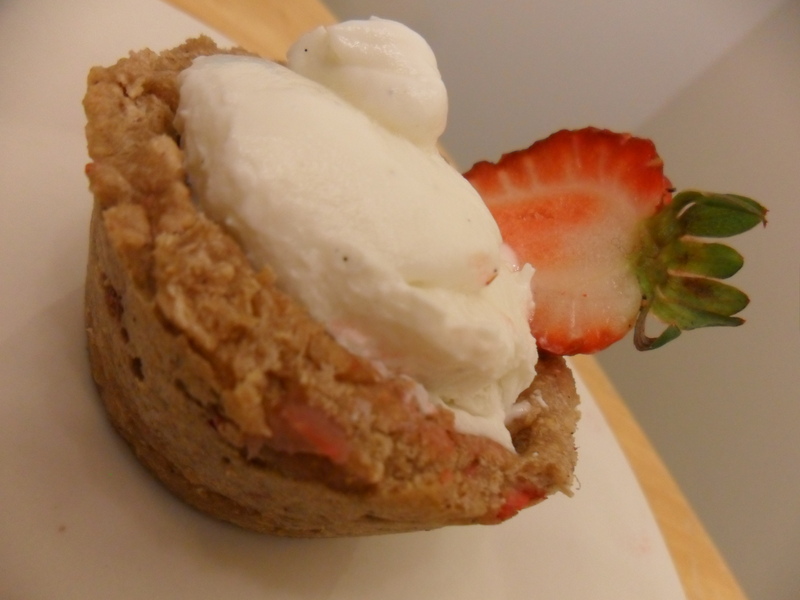 I’ll copy and paste the sweet-pink strawberry dough recipe I used below, but get creative! I also did something similar with my super-moist chocolate blueberry cupcake recipe, but I made the cups smaller by dividing into two, scraped out the sides, and filled with a one-part peanut butter and one-part cream cheese frosting filling. Yes, I was proud of this secondary cake cup, too. It tasted just like a Reese’s Peanut Butter Cup, only cakier! And in case you’re wondering, no you can not taste the blueberry, but you will be amazed at how moist the fruit puree makes the cake. -Preheat the oven to 425 degrees. Lightly grease a cookie sheet and set aside. -Combine all dry ingredients in a small bowl; push to one side. On the other side, mix all wet ingredients. Combine wet and dry thoroughly. It’s okay if there are some chunks of fruit in the batter, but too many or too large of a chunk will bake into a gummy texture you won’t like. 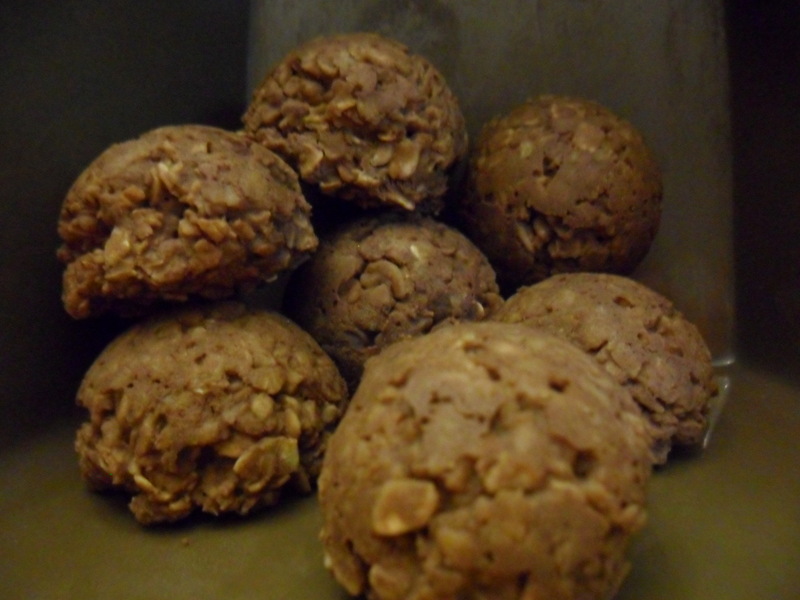 -To form cookies, roll into small balls. If you’d like, however, to make doughnuts, you can simply shape a doughnut round by using a specialized pan, or doing as I do, which is using the rim of a muffin tin slot to shape an O. You could also use a cookie cutter that’s shaped like an O, but if you do this make sure the dough is thick enough–consider layering two or three Os. -Bake for about 6-7 minutes. -Preheat oven to 350 degrees and lightly grease a cookie sheet or prepare with a cupcake liner. -Puree blueberries or mash with a fork. Then mix in vanilla, oil, and milk. Set aside. -In a small bowl, combine all dry ingredients. Transfer these to the wet ingredients, mixing in slowly. Be sure not to overmix. -Spoon batter into cupcake tin and bake for about 11-13 minutes. These toppings could be really fun. You could go more muffin like, as I did, with fresh coconut cream and blueberries. 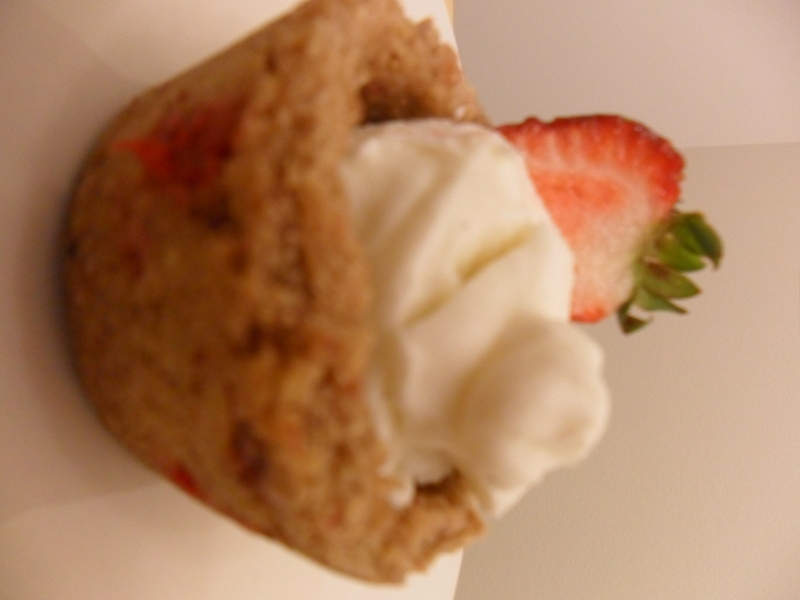 Or you could add icing because, essentially, this muffin could pass as a cupcake, too! 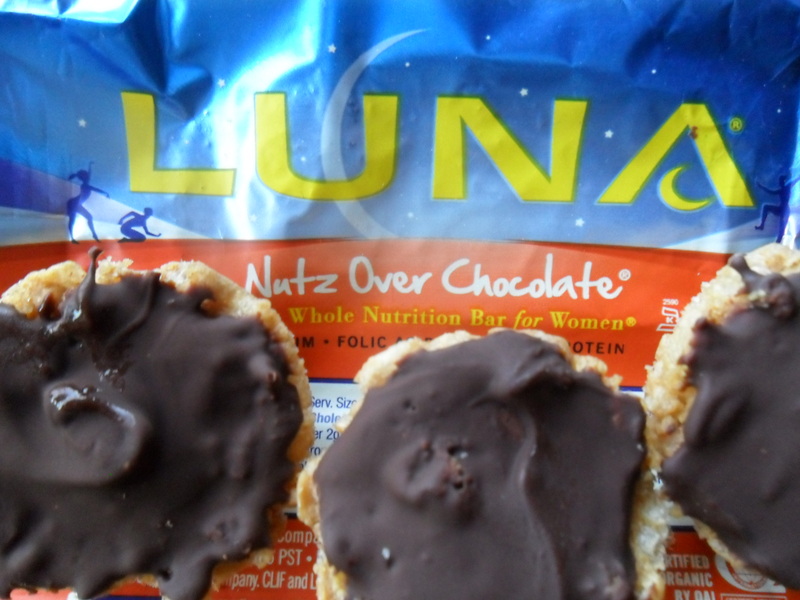 Luna bars are pretty good. They claim to be the very best nutrition bar for women, and they’re certainly not bad considering they’re packed with vitamins and minerals. But what if you could just make your own? And do so using a lot less sugar. The thought came to me when I was perched up in the engineering complex quad, munching on a promotional Luna bar, “Nutz Over Chocolate,” to be exact. I thought to myself, “I can make this. Easy!” With Chocolate-Covered Katie’s copycat recipe as a guide, I went to work. Changed a few ingredients around. Scaled back to a single serving. And then decided that a candy ball was more fun than a regular bar. I’m not going to hold anything back. I’m just going to say it: This recipe is SO MUCH BETTER than the Luna bar I had for lunch today. So much. Thank goodness for pleasant surprises. -Preheat oven to 330 degrees. Lightly grease a baking dish. I used a cake balls tray for this candy-like version, but you can use a regular ramekin. -In small bowl, toss crispies and flour together. 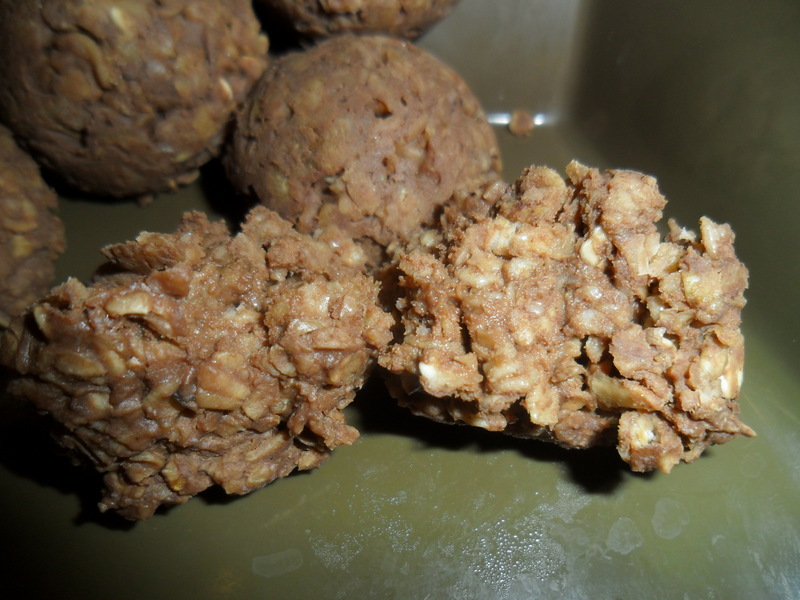 Place nut butter, sweetener, and vanilla on top. Microwave for a few seconds (7-9) just to warm up the mix. -Mix well. Smash the crispies for a tighter crisp, and to keep all ingredients stuck together better. -Press into your dish. Evenly distribute chocolate chips on top. I used two per candy. -Bake for only 2-3 minutes. 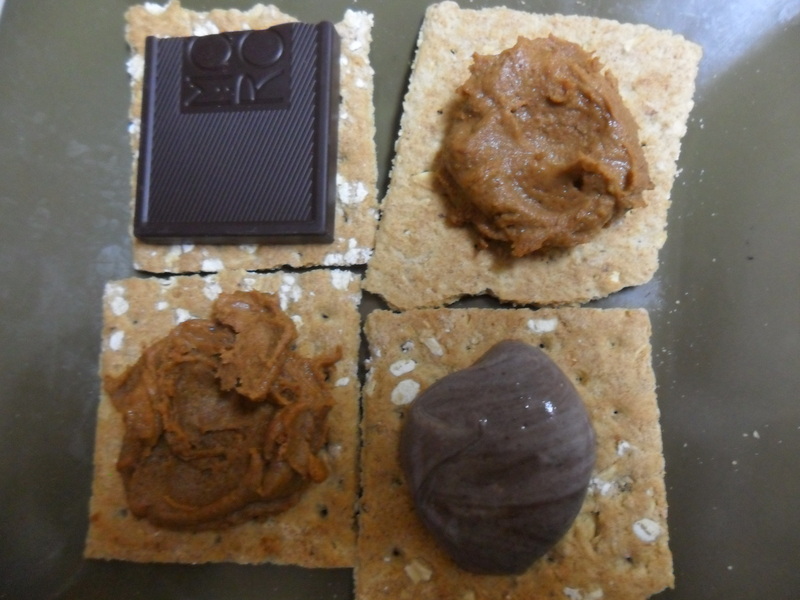 This is just long enough to let some of the ingredients fuse and melt the chocolate on top. -Remove from oven. Smear the chocolate around for a bottom coating. Let cool in the freezer. Pop out and serve. I’ve got a soft spot for soft cookies. And that spot turns to goo when those cookies just so happen to feature my two favorite dessert ingredients: chocolate and peanut butter. …Hello, Jackie’s Nirvana. Nice to finally find you. 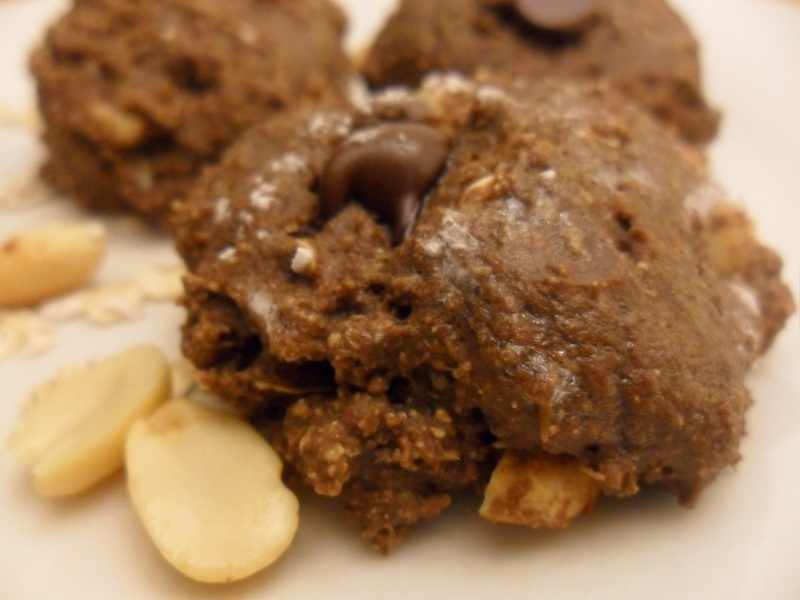 In all seriousness, this is a very good cookie recipe for those that like nuttier desserts. You can’t quite dismiss it as a peanut butter cup cookie, I think, because it’s not equal parts chocolate and peanut butter. I’d say it’s on the nuttier side. Try it. If you do, you may need to be reminded that this is a healthy cooking blog, featuring only all-natural, whole-food recipes, because these are going to taste so sweet sin. -In a small bowl, blend together the dry ingredients. Set aside. -In another small bowl, blend all wet ingredients well. Mix in dry. 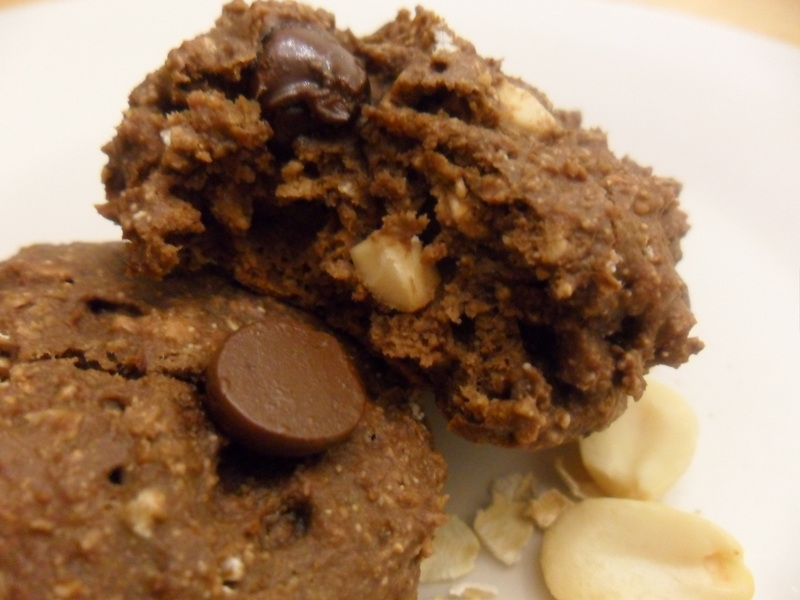 -Once well-blended, mix in nuts and chocolate chips. Using a cookie scoop, if you have one, scoop out dough and place evenly on cookie sheet. 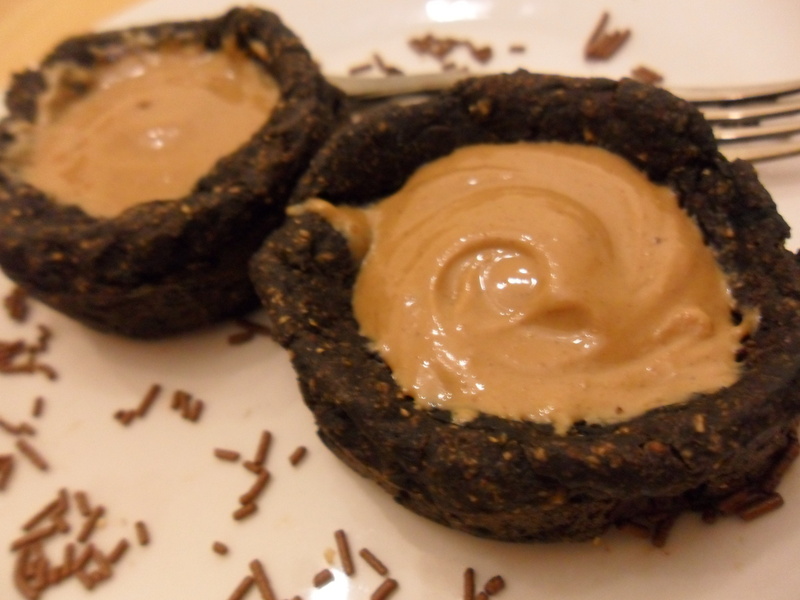 -Optional: wet the bottom of a glass jar and dip in stevia. Use the sugar-crusted bottom to flatten cookies (for a smooth surface). -Bake for 8-10 minutes (longer for crispier cookies). But you don’t have to be training for anything to love these. You can whip up a small batch of six without guilt. All the ingredients are wholesome. All the ingredients will give you the fuel your body through the day. 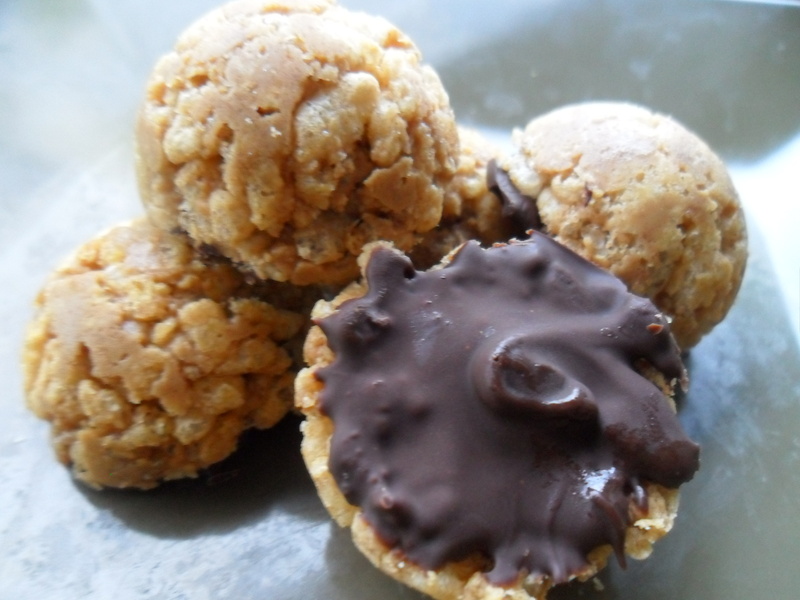 I made these for dessert, but I think they’d be great for breakfast, too. 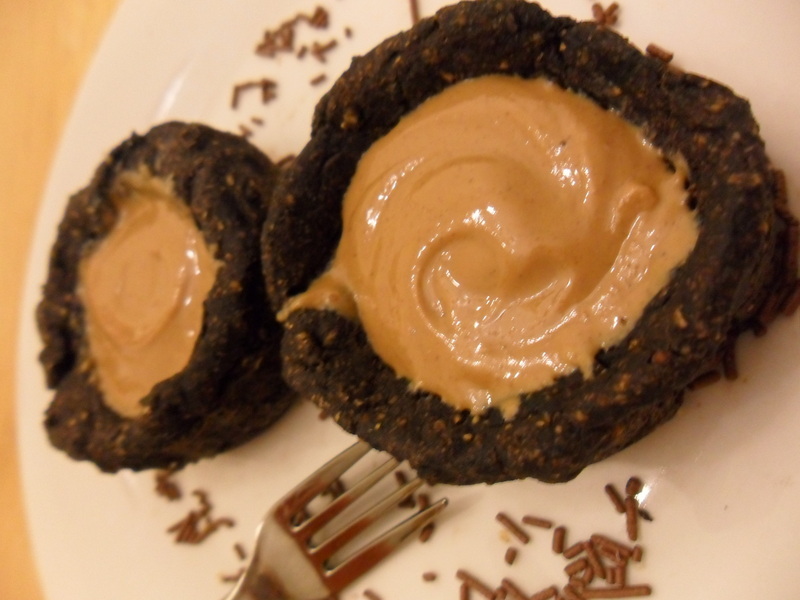 -In a small bowl, mix stevia and cocoa. I added a little cinnamon, too, but that’s just because I love it. -Drop the t of butter on top; then add milk. Microwave for about 15 seconds and stir well. -Stir in salt and vanilla. Once blended, melt in the peanut butter. 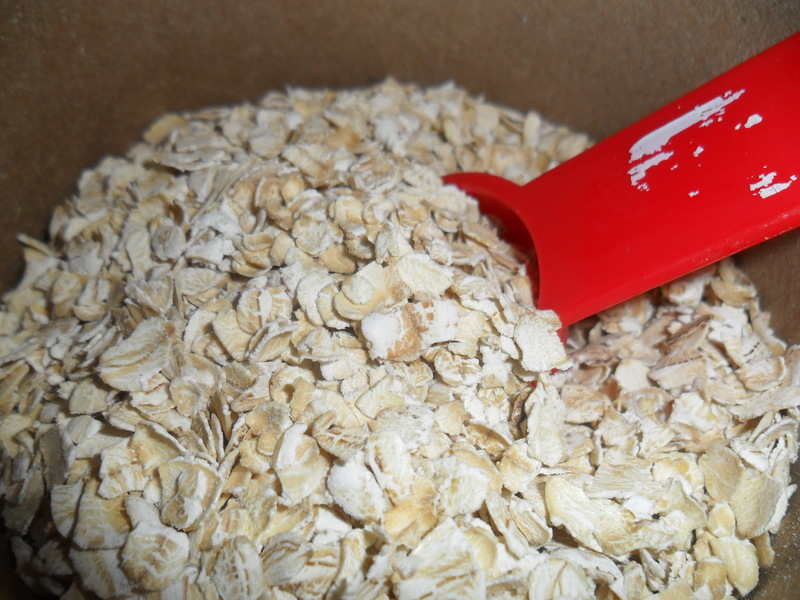 -Last, mix in the oats. Form into little balls and let cool for a few minutes. I actually pressed mine into a cake pop mold. They cooled in a perfectly round shape.